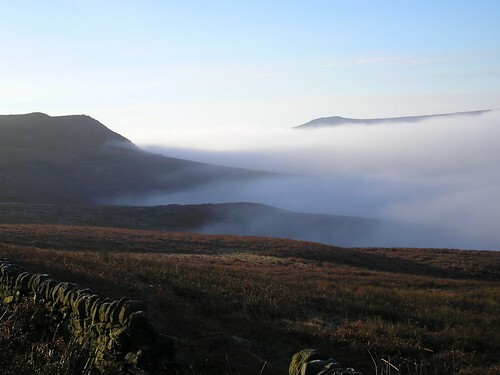 The Peak District Challenge is series of team trekking (walking and/or running) challenges with five levels of difficulty. There are options for different levels of experience and fitness, from 10km, to a day-long walk that is suitable for most, to an ultra-marathon for fit and experienced hill walkers and runners. You can chose to navigate around the course for yourself or join a led group with a mountain leader. The routes all start and finish in Hathersage and are shown in broad detail on the map below. The 10km Back Before Dark challenge is the only clockwise loop, following the pink line through one water station to pretty Shatton and back. The 25km Copper route follows a circuit of 25km, passing through six checkpoints. Start heading south from Hathersage on the Blue route to Baslow, then follow the red route home. The challenge starts at 9.30 on Saturday morning. The 50km Bronze route does the third smallest circle, (a mere 50km!) passing through seven checkpoints starting with the bronze line heading west from Hathersage. The target finishing time is 12 hours, starting at 8.30am on Saturday morning.